I've exported some video at University in uncompressed Microsoft AVI and it doesn't play in quicktime or vlc at home on my MacBook. Here's another case: My MacBook Pro won't play AVI videos. When I try to watch it, it just shows a white screen with garbled video. Anybody know what the problem is? Media player for Mac QuickTime won't recognize AVI on MacBook, VLC sometimes fails to read the video formatted in AVI. Is there any way to play AVI on MacBook (Pro,Air) with QT, VLC or other media players? Find out answers below. To play AVI on MacBook, you can convert AVI format to QuickTime supported formats MOV, M4V or MP4. 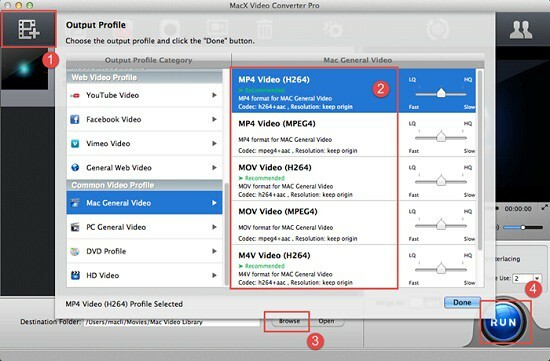 MacX Video Converter Pro has proven to be great in the realm of video conversion. 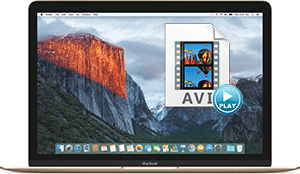 The software enables you to watch AVI on MacBook Air/Pro with no formats limits by converting AVI to QuickTime supported formats like MP4, with ZERO quality loss and super faster speed. It is specifically designed for macOS. Besides, it also can convert any AVI video to HEVC/H.265 codec for playback on your Macbook working with macOS High Sierra in such a way to release more space for your Mac's hard drive. Step 1: Free download the AVI video converter on MacBook and run it. Click "Add File" button to load the AVI file for playback on MacBook. Step 2: Select an output format. Choose "MP4" video format to convert AVI to MP4, AVI to M4V or MOV, or other best format for MacBook. Step 3: Click "Browse" button to choose a destination folder to save converted AVI files. Step 4: Click "RUN" button to start AVI video file conversion for playing AVI on new MacBook Pro or 2018 MacBook Air Retina with any AVI player. Playing AVI file on MacBook is a snap. The AVI converter for MacBook does a good job in converting AVI to QuickTime MOV MP4 etc. on MacBook. What's more, there are more ultra-rich features you'll love. The program is able to convert among video files, like AVI to MP4, MKV to MOV, M2TS to AVI, to name just a few. Additionally, it allows you to download and play AVI video movies on MacBook, iMac 4K 5K, Mac computers from YouTube, Vimeo, Dailymotion, Metacafe, Facebook, 300＋ sites. QuickTime won't play AVI on Sierra, El Capitan MacBook, the problem will be analyzed below. In fact, you have many other players to choose from for playing video formatted AVI on MacBook. If you are looking for a AVI video player for MacBook without requiring to install codec pack, 5KPlayer works like a charm. 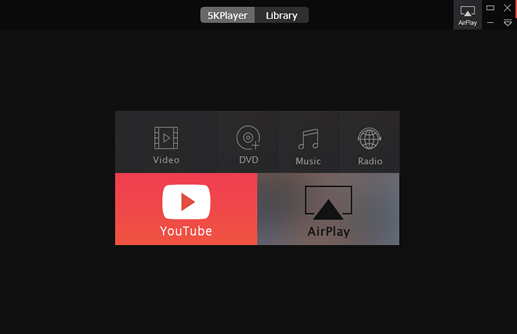 5KPlayer is a new free AVI media player for MacBook(Pro/Air), enabling you to play SD HD 4K UHD AVI video on MacBook Pro/Air, iMac etc. with surprisingly great audio and image quality. With frequent update, the best video player for MacBook fully supports macOS Mojave, (High) Sierra, El Capitan and earlier OS, offering you free access of playing AVI files with codecs DivX, Xvid or 3ivX etc. on MacBook runnning the macOS Sierra, El Capitan, Yosemite smoothly. 1. Download the AVI video player for MacBook 5KPlayer and run it. 2. Load the AVI files by clicking "Video" on the main interface. Or you can drag and drop AVI video to the main window. It also works to right click AVI file, open with 5KPlayer. The all-in-one AVI file player for MacBook also plays 720p/1080p/4K UHD/8K videos in MKV, M2TS, FLV, MOV, MP4, AVCHD, music audio in MP3, AAC, AC3 etc., region-free DVDs, and many more on Mac and Windows(including Win 10). Better still, it downloads video movies in AVI, MP4, MOV, MKV any formats from YouTube, Dailymotion, Vimeo, Vevo, over 300 sites for free. I have a number of movie files that will not open and play with my Quicktime player even though they are .avi files...Should I download a file converter to change the AVI file format, say, mov. or download a codec to decode AVI files on MacBook. This is because AVI codec, which is a bit complicated. Put it simply, you need to know how the AVI file is coded, and download the right codec to decode and reencode AVI video on Mac computer. Most AVI videos use Xvid, DivX and 3ivX codecs. It is a huge task to figure out codec your AVI files use and download the proper codec to open and watch AVI video on MacBook. If you are a person who struggle with technical things, this way is not recommended. To realize a flawless AVI playback experience on your Macbook, you can install QuickTime component Perian. Perian helps QuickTime play AVI on MacBook, also other formats MKV, FLV, MTS, DivX, WMA and more. After being installed, Perian works automatically when playing AVI files with QT in MacBook. However, you need to note that QuickTime won’t play all media types, including AVI files with codecs unaccepted by QT. What's more, Perian is no longer under development and it fails to work with QuickTime 10 or later. So, we suggest you to convert AVI to MP4, MOV QuickTime supported formats.